A new internal investigation reveals just how poorly US African Command has handled its humanitarian missions. Dar es Salaam, Tanzania—Movie night in Mouloud, Djibouti. Skype lessons in Ethiopia. Veterinary training assistance in Garissa, Kenya. And in this country on the east coast of Africa, work on both primary and secondary schools and a cistern to provide clean water. These are all-American good works, but who is doing them—and why? As I sit in a room filled with scores of high-ranking military officers resplendent in their dress uniforms—Kenyans in their khakis, Burundians and Ugandans clad in olive, Tanzanians in deep forest-green sporting like-colored berets and red epaulets with crossed rifles on their shoulders—chances are that the US military is carrying out some mission somewhere on this vast continent. It might be a kidnapping raid or a training exercise. It could be an airstrike or the construction of a drone base. Or, as I wait for the next speaker to approach the lectern at the “Land Forces East Africa” conference in Dar es Salaam, Tanzania, it could be a humanitarian operation run not by civilians in the aid business but by military troops with ulterior motives—part of a near-continent-wide campaign utilizing the core tenets of counterinsurgency strategy. The United States is trying to win a war for the hearts and minds of Africa. 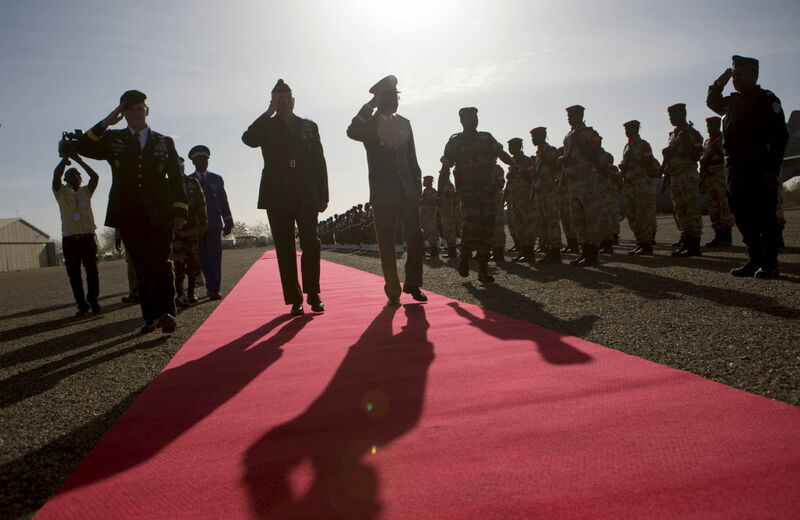 But a Pentagon investigation suggests that those mystery projects somewhere out there in Djibouti or Ethiopia or Kenya or here in Tanzania may well be orphaned, ill-planned and undocumented failures-in-the-making. According to the Department of Defense’s watchdog agency, US military officials in Africa “did not adequately plan or execute” missions designed to win over Africans deemed vulnerable to the lures of violent extremism. This evidence of failure in the earliest stages of the US military’s hearts-and-minds campaign should have an eerie resonance for anyone who has followed its previous efforts to use humanitarian aid and infrastructure projects to sway local populations in Vietnam, Iraq or Afghanistan. In each case, the operations failed in spectacular ways, but were only fully acknowledged after years of futility and billions of dollars in waste. In Africa, a war zone about which most Americans are completely unaware, the writing is already on the wall. Or at least it should be. While Pentagon investigators identified a plethora of problems, their report has, in fact, been kept under wraps for almost a year, while the command responsible for the failures has ignored all questions about it from TomDispatch. Today, the US military increasingly confronts Africa as a “battlefield” or “battleground” or “war” in the words of the men running its operations. To that end, it has built a sophisticated logistics network to service a growing number of small outposts, camps and airfields, while carrying out, on average, more than one mission each day somewhere on the continent. A significant number of these operations take the form of a textbook hearts-and-minds campaign that harkens back to failed US efforts in Southeast Asia during the 1960s and 1970s and more recently in the Greater Middle East. In Vietnam, the so-called civilian half of the war—building schools, handing out soap and offering rudimentary medical care—was obliterated by American heavy firepower that wiped out homes, whole hamlets and whatever goodwill had been gained. As a result, US counterinsurgency doctrine was tossed into the military’s dustbin—only to be resurrected decades later, as the Iraq War raged, by then-general and later CIA director David Petraeus. In 2005–06, Petraeus oversaw the revision of FM 3-24, the military’s counterinsurgency (COIN) field manual and a resulting revolution in military affairs. Soon, American military officers in Iraq and Afghanistan were throwing large sums of money at complex problems, once again with the objective of winning hearts and minds. They bought off Sunni insurgents and poured billions of dollars into nation-building efforts, ranging from a modern chicken processing plant to a fun-in-the-sun water park, trying to refashion the rubble of a failed state into a functioning one. As with Petraeus’s career, which imploded amidst scandal, the efforts he fostered similarly went down in flames. In Iraq, the chicken processing plant proved a Potemkin operation, and the much-ballyhooed Baghdad water park quickly fell into ruin. The country soon followed. Less than three years after the US withdrawal, Iraq teeters on the brink of catastrophe as most of Petraeus’s Sunni mercenaries have stood aside while the brutal Islamic State has carved a portion of its caliphate from the country, and others, aggrieved with the US-backed government in Baghdad, have sided with them. In Afghanistan, the results have been similarly dismal, as America’s hearts-and-minds monies have yielded roads to nowhere (where they haven’t already deteriorated into death traps), crumbling buildings, over-crowded, underfunded and teacher-less schools, and billions poured down the drain in one boondoggle after another. US Africa Command (AFRICOM) and its subordinate command, Combined Joint Task Force–Horn of Africa (CJTF-HOA) based at Camp Lemonnier in Djibouti, have spent years engaged in such COIN-style humanitarian projects. These have been touted in news releases at their websites in lieu of candid information on the true scale and scope of AFRICOM’s operations, the exponential growth of its activities, its spy operations and shadowy base-building efforts. Take a cursory glance at its official news releases and you’ll find them crammed with feel-good stories like an effort by CJTF-HOA personnel to tutor would-be Djiboutian hotel workers in English or a joint effort by the State Department, AFRICOM and the Army Corps of Engineers to build six new schools in Togo. Such acts are never framed in the context of counterinsurgency nor with an explicit link to US efforts to win hearts and minds. And never is there any mention of failings or fiascos. However, an investigation by the Department of Defense’s Inspector General (IG), completed last October but never publicly released, found failures in planning, executing, tracking, and documenting such projects. The restricted report, obtained by TomDispatch, describes a flawed system plagued by a variety of deeply embedded problems. In some cases, military officials failed to identify how their projects even supported AFRICOM’s objectives on the continent; in others, financial documentation was missing; in still others, CJTF-HOA personnel failed to ensure that local populations were equipped to keep the small-scale projects running or effective once the Americans moved on. The risk, the report suggests, is that these signs of Washington’s goodwill and good intentions will quickly fall into disrepair and become what one American official called “monuments to US failure” in Africa. AFRICOM reacted defensively. In an internal memo, Colonel Bruce Nickle, the acting chief of staff of US Africa Command, criticized the inspector general’s methodology, questioned the IG’s expertise and suggested that some of the findings were “misleading.” Close to a year after the report’s release, neither AFRICOM nor CJTF-HOA has announced policy changes based on its recommendations. Repeated requests, over a period of months, by TomDispatch to AFRICOM media chief Benjamin Benson and the CJTF-HOA Public Affairs office for comment, further information, or clarification about the report as well as a request to interview Nickle have all gone unanswered. Across Africa, the US military is engaged in a panoply of aid projects with an eye toward winning a war of ideas in the minds of Africans and so beating back the lure of extremist ideologies—from that of Boko Haram in Nigeria to Somalia’s al Shabab. These so-called civil-military operations, or CMOs, include “humanitarian assistance” projects like the construction or repair of schools, water wells and waste treatment systems, and “humanitarian and civic assistance” (HCA) efforts, like offering dental and veterinary care. Kindness may be its own reward, but in the case of the US military, CMO benevolence is designed to influence foreign governments and civilian populations in order to “facilitate military operations and achieve US objectives.” According to the Pentagon, humanitarian assistance efforts are engineered to improve “US visibility, access, and influence with foreign military and civilian counterparts,” while HCA projects are designed to “promote the security and foreign policy interests of the United States.” In the bureaucratic world of the US military, these small-scale efforts are further divided into “community relations activities,” like the distribution of sports equipment, and “low-cost activities” such as seminars on solar panel maintenance or English-language discussion groups. Theoretically, at least, add all these projects together and you’ve taken a major step toward winning Africans away from the influence of extremists. But are these projects working at all? Has anyone even bothered to check? In a report titled “Combined Joint Task Force–Horn of Africa Needed Better Guidance and Systems to Adequately Manage Civil-Military Operations,” the Department of Defense’s Inspector General found record keeping so abysmal that its officials “did not have an effective system to manage or report community relations and low cost activities.” A spreadsheet supposedly tracking community low-cost activities during 2012 and 2013 was so incomplete that 43 percent of such efforts went unmentioned. Nonetheless, the IG did manage to review forty-nine of 137 identified humanitarian assistance and civic assistance projects, which cost US taxpayers about $9 million, and found that the military officials overseeing CMO “did not adequately plan or execute” them in accordance with AFRICOM’s “objectives.” Close to 20 percent of the time, Combined Joint Task Force–Horn of Africa even failed to accurately explain the possible relationship of specific projects to objectives like countering extremist organizations or expanding AFRICOM’s “network of partners on the continent.” Examining sixty-six community relations and low cost activities, investigators found that CJTF-HOA had failed to accurately identify their strategic objectives for, or maintained limited documentation on, 62 percent of them. The task force also failed to report or could not provide information on expenditures for four of six projects selected for special review, despite a requirement to do so and the use of a computerized system specifically designed to track such information. These projects—two schools and a clinic in Djibouti as well as a school in Ethiopia—cost American taxpayers almost $1.3 million, yet US officials failed to properly account for where all that money actually went. All told, officials were unable to verify whether almost $229,000 in taxpayer dollars spent on such projects were properly accounted for. Investigators only inspected four humanitarian assistance worksites—two in Djibouti and two here in Tanzania—but even in this tiny sample found one site where the US military had failed to ensure that the host nation would sustain the project. At the Ali Sabieh Community Water Fountains in Djibouti, renovated by the United States in 2010 to minimize waterborne disease, investigators found a scene of utter disrepair. Doors, pipes and faucets “had been removed,” while another faucet “had a collapsed top,” leaving the water “exposed to contaminants.” Photographs taken two years after the project was completed display dilapidated, crumbling and seemingly jerry-rigged structures. One American official assured IG investigators of the necessity of obtaining host nation “buy-in” on such projects to achieve success, while another suggested it was crucial that local “sweat equity” be invested in such projects, if they weren’t to become “monuments to US failure.” In Djibouti, however, local residents were apparently given no information about upkeep of the Ali Sabieh project. As a result, Djiboutians threw rocks into a well built by Americans, a method that works to raise water in indigenously built wells. In this case, however, it damaged the well so badly that it stopped working. Examining a sample of projects, the Pentagon’s investigators found that 73 percent of the time CJTF-HOA personnel failed to collect sufficient data thirty days after completion of projects, to assess whether it achieved the stated objectives. For example, five hours north of here at a medical clinic at Manza Bay, the United States built cisterns and a water catchment system. The project was apparently considered a success, but the military had very little data to back up that claim. In Garissa, in neighboring Kenya, a veterinary civic action project was evidently also declared a triumph without anything to prove it beyond vague upbeat claims of success in impressing local residents. Winning Hearts and Minds or Losing Money and Influence? After reviewing a draft of the Inspector General’s report last year, AFRICOM Chief of Staff Nickle offered a response clearly meant to undermine the Pentagon watchdog’s claims. In his September 2013 memorandum, Nickle took particular issue with the Inspector General’s investigative methodology, decrying its lack of statistical sampling. Since the report is restricted, the IG’s office refused to discuss the specifics of its analysis with TomDispatch, but Brenda Rolin of its Office of Communications and Congressional Liaison defended the methodology. Non-statistical sampling, she explained, “can be used to obtain sufficient audit evidence. This method is valid but results may not be projected to the entire population.” Nickle also complained that the IG’s team did not include an expert familiar with all the types of humanitarian efforts AFRICOM carried out and that the investigators failed to highlight its successes. Nearly a year has passed since the drafting of the Inspector General’s report. During that time, neither AFRICOM nor CJTF-HOA has publicly addressed it or announced any changes based upon its recommendations. In the meantime, the hearts and minds of allied African military leaders appear unswayed by AFRICOM’s efforts. Over two days at the “Land Forces East Africa” conference here in Dar es Salaam, I listened to generals and defense analysts from around the region speak on security matters affecting Burundi, Kenya, Somalia, Uganda and Tanzania. They touched on the key issues—extremism, terrorism and piracy—that the American hearts-and-minds campaign is meant to counter, but the United States was hardly mentioned. Tanzanian officers I talked with, for instance, were pleased to be receiving American funds, but less so with direct US interventions of any type on the continent. None I spoke with seemed aware of AFRICOM’S hearts-and-minds work like clean water projects or school construction in underdeveloped rural areas not so very far from where we’ve been sitting. Even Egan O’Reilly, an Army officer attached to the US Embassy here, whose job is to facilitate “security cooperation” activities, had little idea about AFRICOM’s humanitarian efforts. Dual-hatted—answering to the US ambassador in Tanzania and AFRICOM—he’s new to the mission but high on America’s efforts in the region. “We’ve done everything from helping bring down trainers for military intelligence courses to building their own schoolhouse for intelligence work,” he tells me. TomDispatch also sought interviews with US defense attachés in Ethiopia, Djibouti and Kenya for assessments of the humanitarian projects in those respective countries. The latter two embassies failed to respond to the requests, while a spokesperson for the US mission in Ethiopia thanked me for my interest but told me that the defense attaché “is not currently available for an interview.” No one, it appears, is eager to talk about the textbook counterinsurgency campaign being carried out by the US military in Africa, let alone the failures chronicled in an IG report that’s been withheld from the public for almost a year. For the last decade, we’ve been inundated with disclosures about billions of US tax dollars squandered on counterinsurgency failures in Iraq and Afghanistan, stories of ruined roads and busted buildings, shoddy schoolhouses and wasteful water parks, all in the name of winning hearts and minds. Below the radar, similar—if smaller scale—efforts are well underway in Africa. Already, the schools are being built, already the water projects are falling to pieces, already the Department of Defense’s Inspector General has identified a plethora of problems. It’s just been kept under wraps. But if history is any guide, humanitarian efforts by AFRICOM and Combined Joint Task Force–Horn of Africa will grow larger and ever more expensive, until they join the long list of projects that have become “monuments to US failure” around the world.